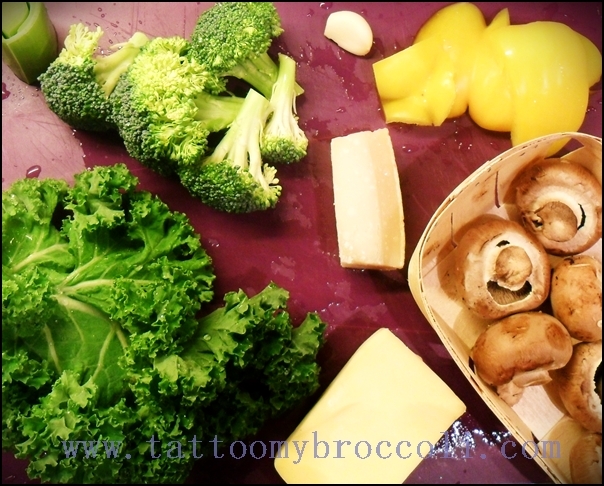 Have some broccoli and eat it too! This soup is very comforting, especially for something that has no butter and cream. I am struggling with gallbladder problems, so I am trying to avoid fats and milk products to minimize the pain. I am getting really sick of chicken by now but still trying to make it palatable. This soup was actually delicious, I would love to eat it even if I were healthy. Put the raw chicken breasts in a pot half-filled with cold water and put on low heat. Let is warm up really slowly and after 20 minutes or so, use a sieve or a spoon to skim the protein from the top. It doesn’t taste bad but looks rather awful. While the chicken is warming up, cube your veggies. Once you skim the broth, take the chicken out and also cube it. Add it back in the soup, together with carrots, celeriac, leek, celery, stock cube and pepper. Let everything boil on medium heat until the carrots are almost done – around 20 minutes. After that time, add the sliced mushrooms, spices and soy milk and cook for another 15 minutes. Add in the cooked pasta just before serving if using. I have discovered something terrible. It turns out that I really have no choice but to eat dairy free. No Parmesan for me, no Pecorino, no Mozzarella, no cheesecake. I mean.. do I even have to go on? It’s a health thing and it’s not fixable, so here I go. I have been trying to get used to it for a couple of weeks now. I am quite happy to drink coffee with soymilk, use margarine on bread etc., but saying goodbye forever to cheese is proving the hardest. I do come up with different new things to eat to make things better and I realised that when going out, it is good to go to a Chinese restaurant or for sushi as these are the places where avoiding milk is the easiest. Well, why not have some mushrooms then? At least they are dairy free. I had a lot of leftover mushrooms and decided to make a bread spread with them. There are so many recipes out there with cream cheese, butter etc. Needless to say, I had to come up with my own version and I think it is delicious. It feels very creamy in your mouth and it is, to be honest, quite a fancy topping for your bread. Melt margarine in a pan and add chopped onion to cook until soft. Add chopped garlic and all the mushrooms. 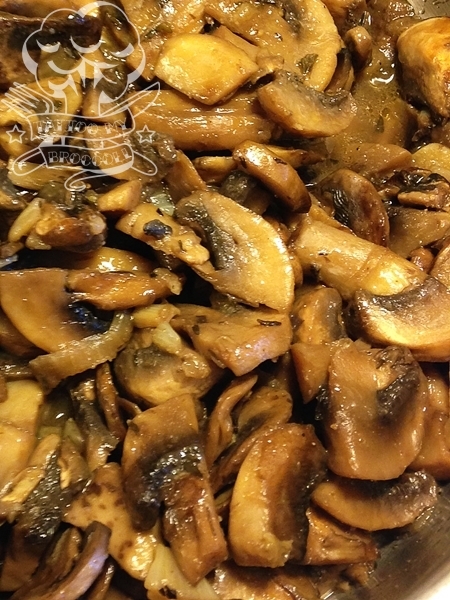 Sprinkle salt and other spices on the mushrooms. You will see that they will release a lot of liquid into the pan. Add wine and cook on low heat for around an hour or until all the liquid has evaporated. Blend the mixture until smooth. I came up with this recipe when away on holiday. I had a jar of mayo in the fridge and knew I had to use it before the holiday was over as bringing it on the plane seemed too crazy. 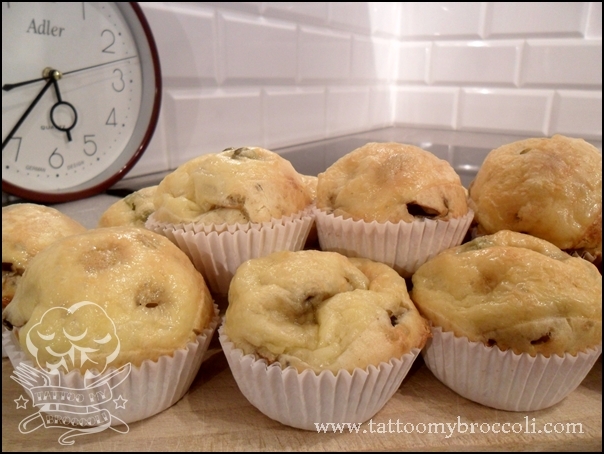 These muffins are really nice and moist inside and are still delicious the next day, so do try them! Preheat the oven to 200C/400F. Prepare a 12 hole muffin tray. In a bowl mix eggs, mayonnaise, pepper, nutmeg and oregano. In a separate container mix flour with salt and baking powder. Add the dry ingredients to the wet ones, add milk and the pea liquid and stir until just blended. 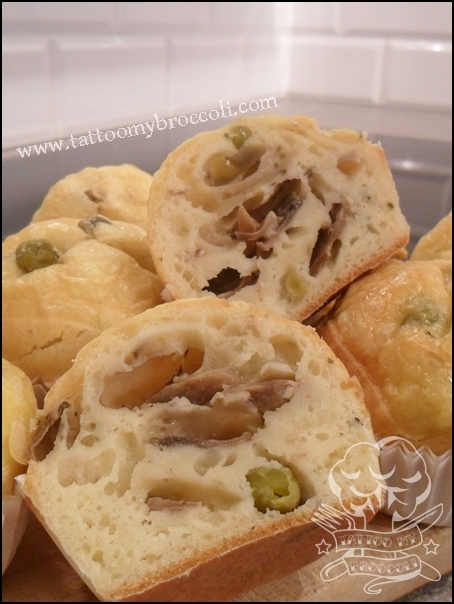 Add peas and mushroom slices and stir to distribute them evenly. © Julia M Wlodarczyk and Tattoo My Broccoli, 2014-2024. Unauthorized use and/or duplication of this material, recipes and images without express and written permission from this blog’s author and/or owner is strictly prohibited. Excerpts and links may be used, provided that full and clear credit is given to Julia M Wlodarczyk and Tattoo My Broccoli with appropriate and specific direction to the original content. This is very much a comfort food for me but also a way to eat a lot of vegetables. 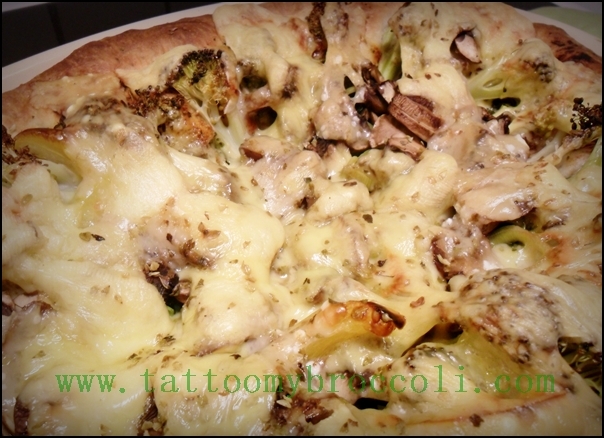 This is a feast of vegetables in an open-faced pie. The danger here is for the vegetable juices to run and soak the dough but as long as you do what I did, it shouldn’t happen. 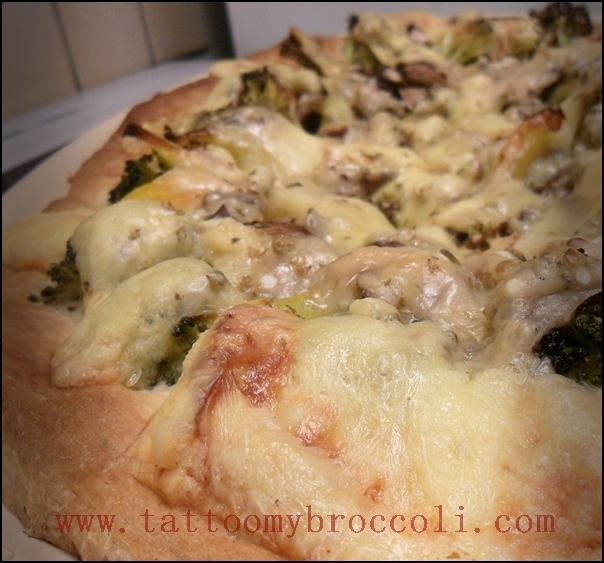 And I would eat this dough even when soaked because it’s delicious. 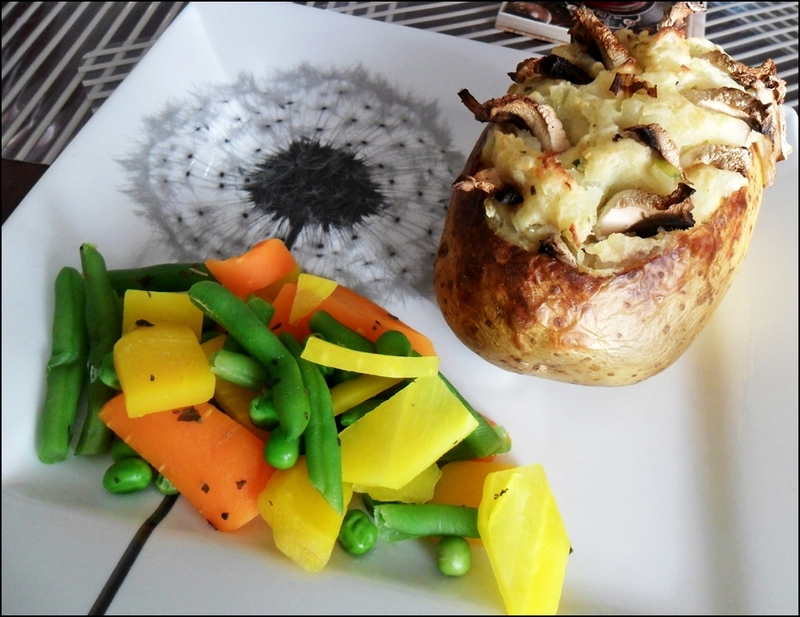 You can be a bit adventurous and use different veggies if you like. I know this version tastes good. If you bought kale especially for this recipe and you’re not sure what to do with the rest of it, you can toss it in the freezer and use the same way you would use spinach later. 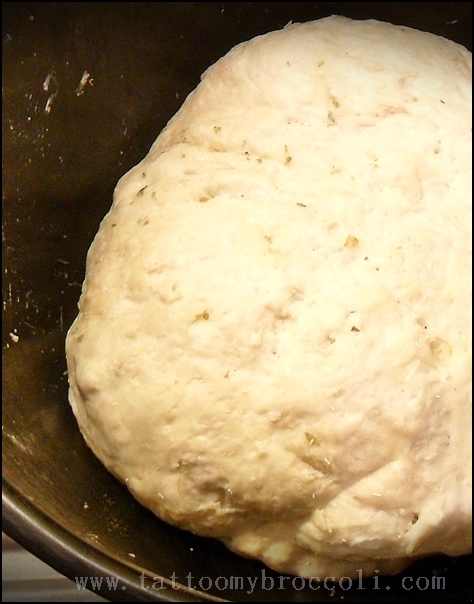 Start with the crust, mix all of the crust ingredients in a bowl and knead until it forms a dough ball. Leave in a warm place under plastic wrap for 30 minutes. When you come back after that time, the dough should have risen. Knead it again to get the air out of it and cover the bowl with a plastic wrap again. Now you can start chopping all the vegetable ingredients. Once you are half way through that process, preheat the oven to 220C/425F, the best program to use is both top and bottom heat. 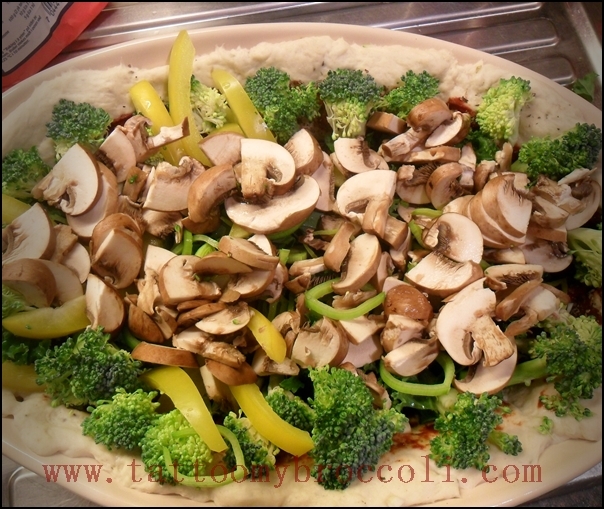 Once all the vegetables are chopped, take the dough out of the bowl, spray a baking dish with cooking oil, so that the dough doesn’t stick and spread the dough all over the bottom and sides of the dish. 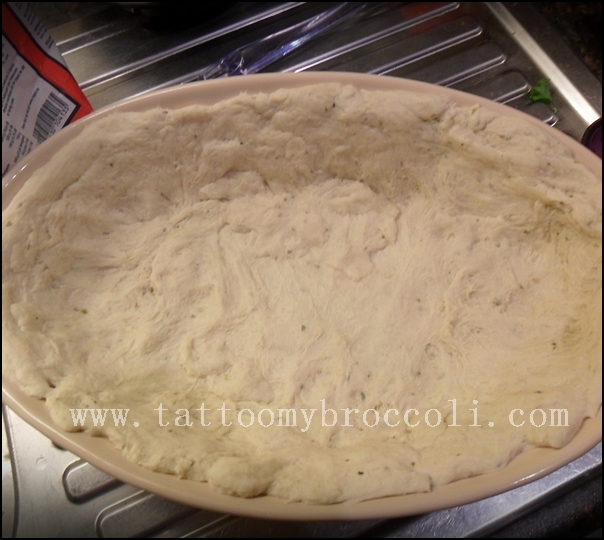 Don’t worry if you’re not very good with dough and there is a hole, just repair it with some leftover dough later. 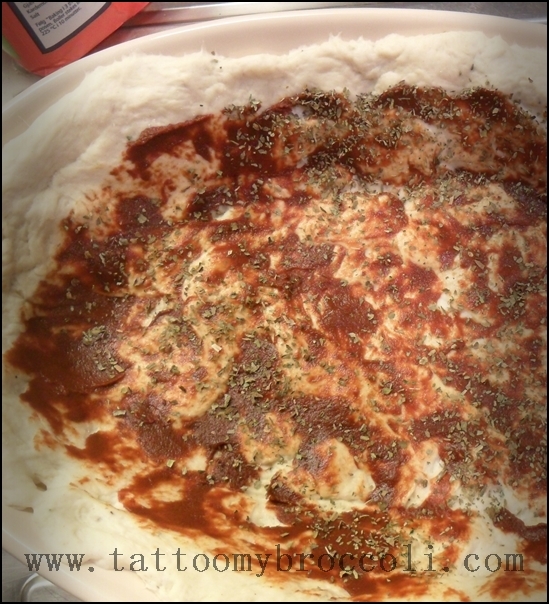 Once done spread the tomato puree around the bottom and sprinkle with herbs. Next start layering the vegetables until you run out. 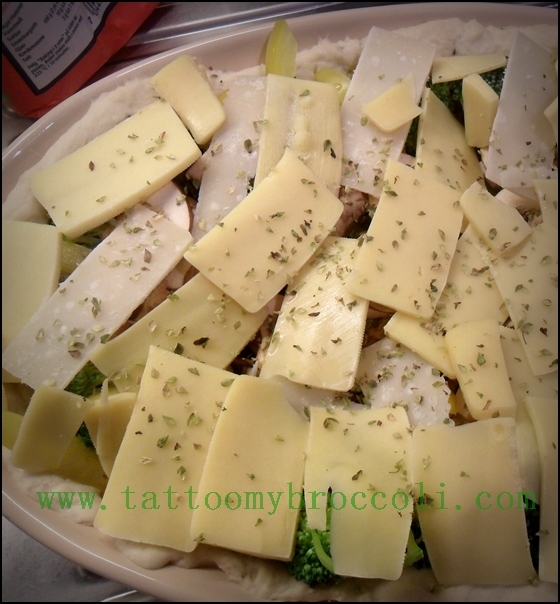 Cover with cheese slices. Bake for 40 minutes or until cheese browns. 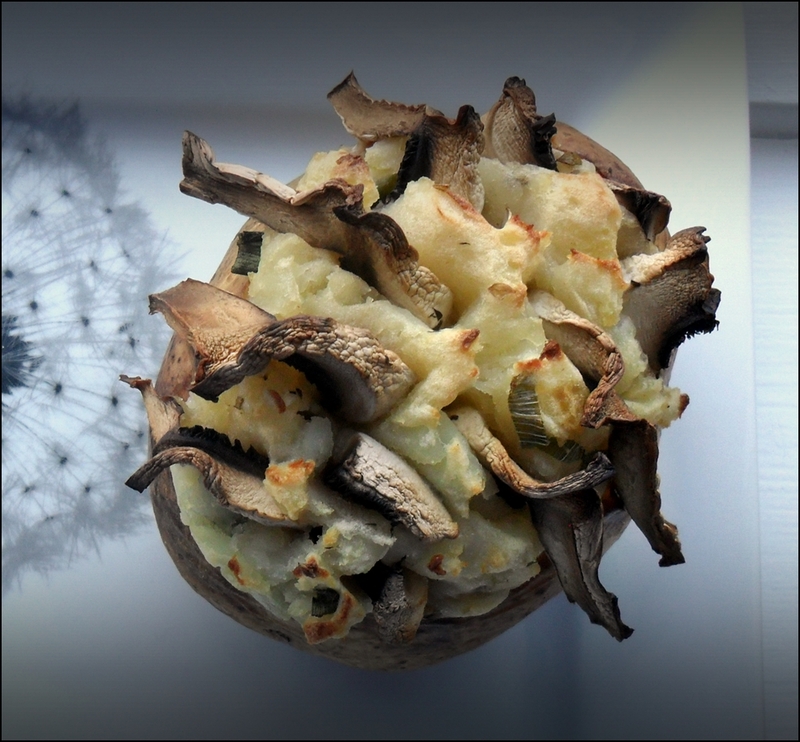 This is a dish that reminds me of beautiful Ireland where I used to live. Granted, there would probably be bacon in the recipe if you ordered this in an Irish pub but it’s still the same soft, comforting goodness. If eating a potato as the main star of your meal seems wrong to you, make some meat with it but I am perfectly happy appreciating the tuber just as it is. Preheat your oven to 200C/395F. 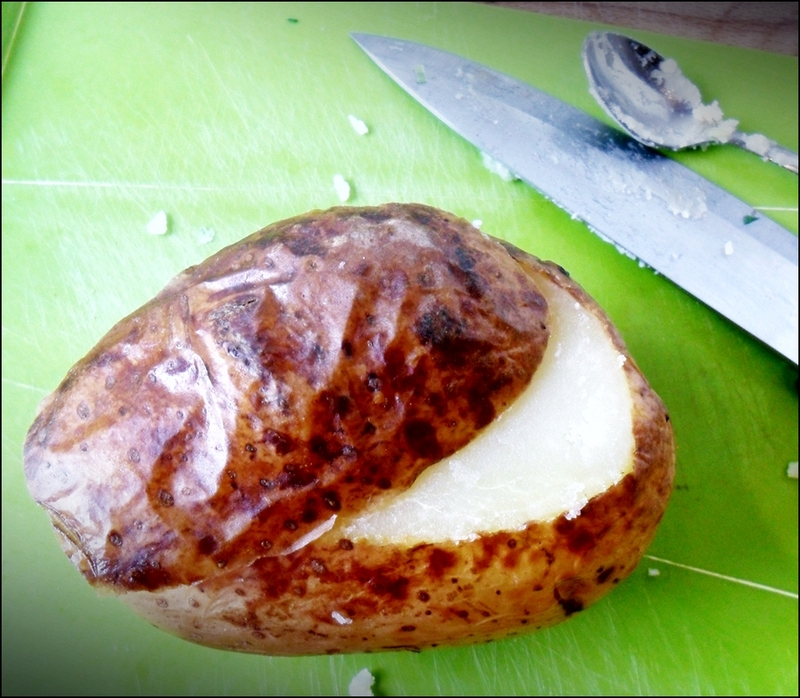 You need to cover the washed and unpeeled potatoes with olive oil. I don’t like touching oily things, so I just pour 1 Tbsp of oil into a plastic bag and toss the potatoes in it until uniformly covered. 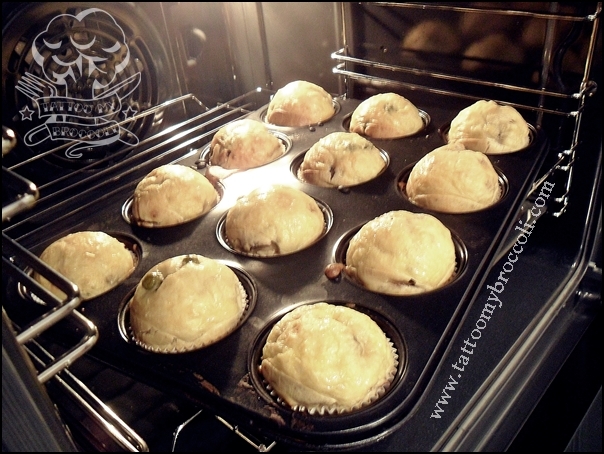 Put the greasy bulbs on a baking tray and into the oven for 1 hour or until tender. Nobody said it’s going to be quick. 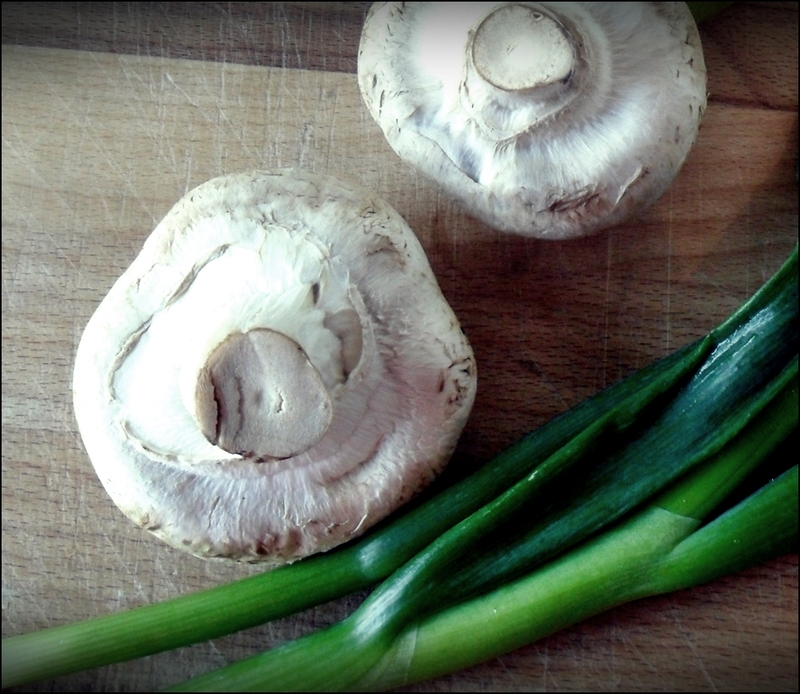 Slice the spring onion and mushrooms and set aside. In a big bowl mix the rest of your oil, spices and chopped spring onion. Once the potatoes are baked and the knife goes into their flesh without much effort, start with cutting off a flat section off the top. This is when I always burn my fingers because I just cannot wait to get to work. Try to learn from my mistakes and let the potatoes cool for 10 minutes at least. 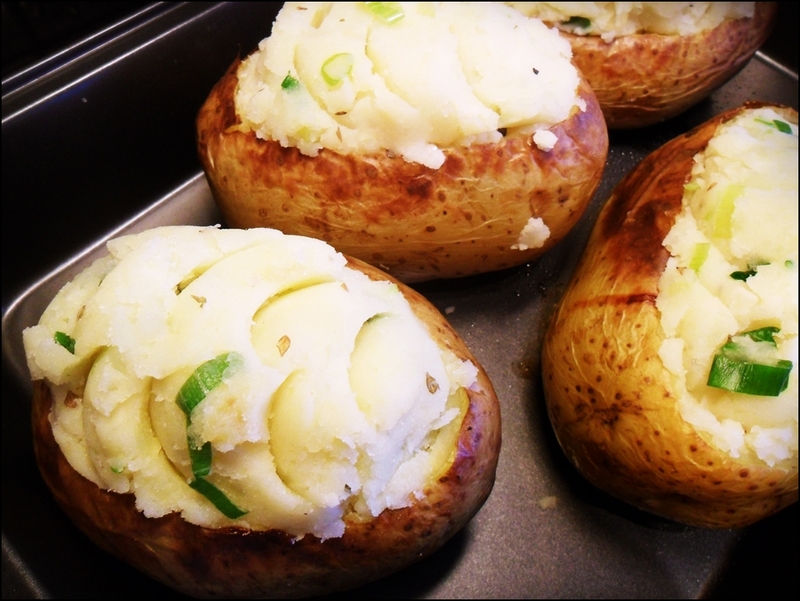 Next, spoon out the potato flesh into the bowl of spices and spring onions. 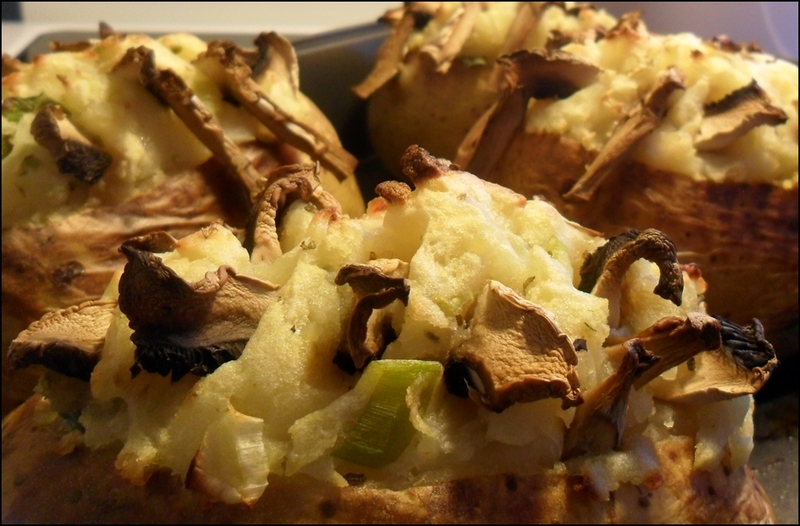 Be careful not to make a hole in the bottom of your potato but if you do, don’t fret. 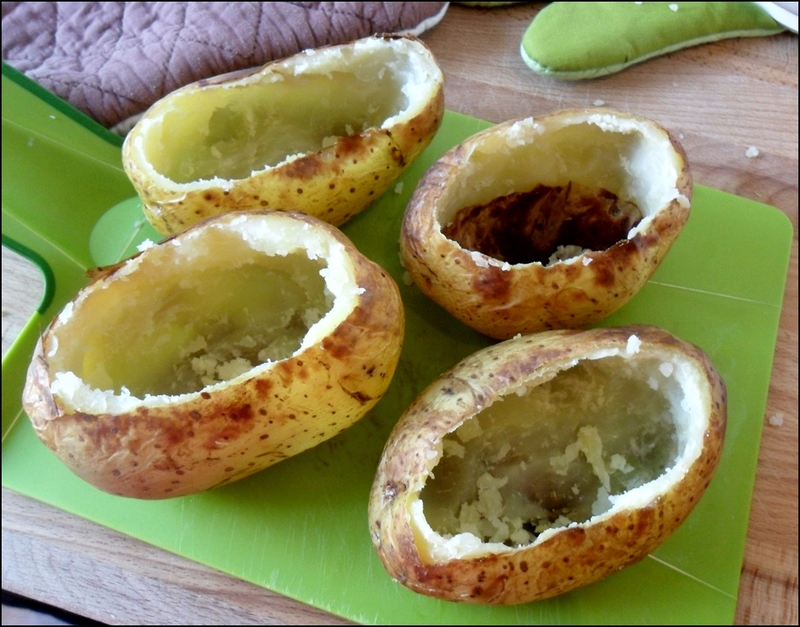 Use my trick (in the photo) and put the skin from the top of the potato in the bottom, to reinforce it. Mash and blend the mixture in the bowl and you’re ready to start stuffing the potatoes with it. Try the mixture first, to make sure that it’s as delicious as you’d like it to be. 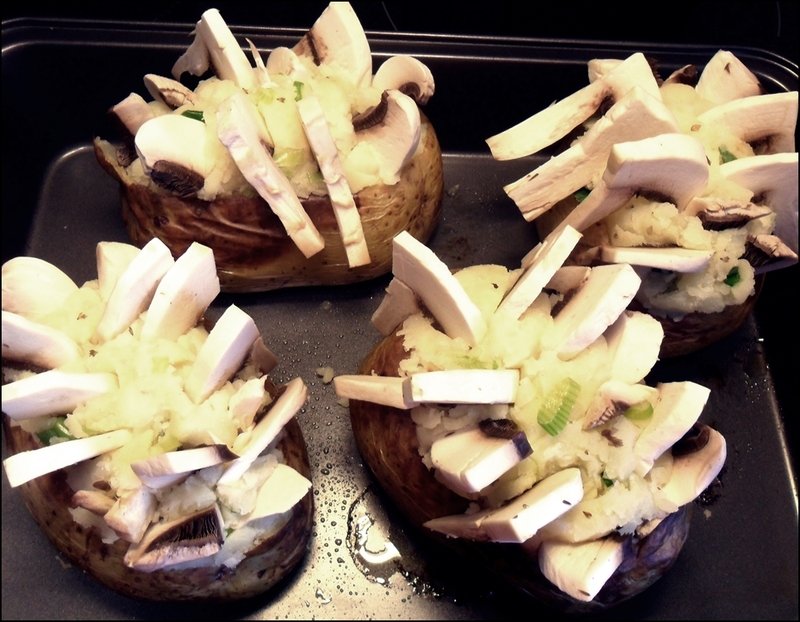 For a finishing touch, place mushroom slices in the soft mash. Bake for another 30 minutes in 200C/395F. I served mine with steamed vegetables. This amount serves 4. © Julia Wlodarczyk and Tattoo My Broccoli, 2014-2024. Unauthorized use and/or duplication of this material, recipes and images without express and written permission from this blog’s author and/or owner is strictly prohibited. Excerpts and links may be used, provided that full and clear credit is given to Julia Wlodarczyk and Tattoo My Broccoli with appropriate and specific direction to the original content. Tattoo My Broccoli Blog at WordPress.com.